If another external data group from an OData connection is referenced in an OData external data group, then a 1:1 relationship can be established between these, provided that a corresponding relationship is defined in the service metadata. With a 1:1 relationship between two OData external data groups (OData terminology: Entity Sets) no primary and foreign keys need to be determined. 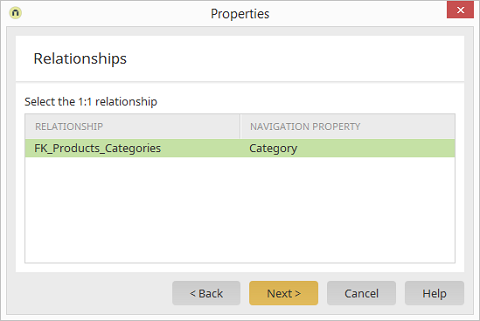 In OData references, the relationship type is determined and selected directly from the metadata of the OData service. Thus, for example, the possible relationships between a seminar data group and a room booking data group are automatically determined by the Connector for OData from the service metadata and made available for selection.